Welcome back again, again, (gasp, pant) and again to Freezermas! I’m letting the dogs out today. Science gone barking mad! Hopefully my puns will not screw the pooch. 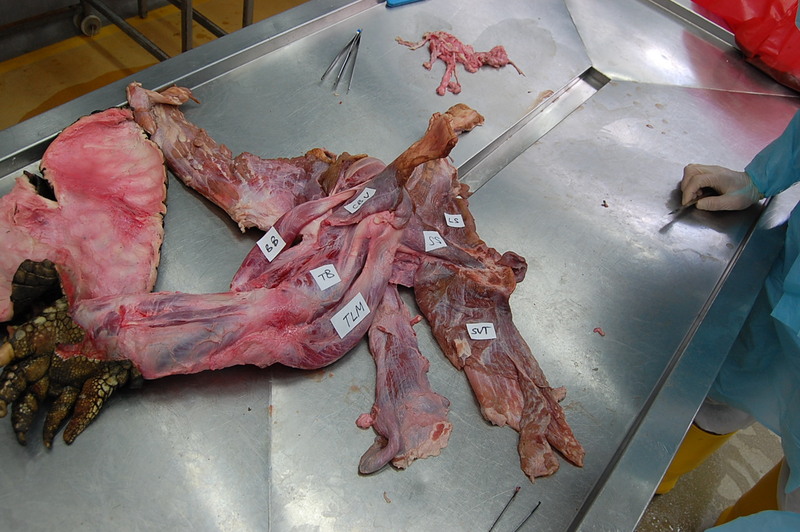 Stomach-Churning Rating: 4/10; a dog cadaver’s leg (not messy), then just tame digital images of anatomy. I am working with Rich Ellis, a former MSc student at Univ. Colorado (see his cool new paper here! ), for a fun new collaboration this year. He was awarded a prestigious Whitaker Foundation scholarship to do this research, which focuses on how different animals stand up from a squatting position, with the legs about as bent as they can be. We want to know how animals do this standing up movement, because it is in some ways a very demanding activity. Very flexed/bent limb joints mean that the muscles (and some tendons) are stretched about as far as they ever will be. So this places them at disadvantageous lengths (and leverage, or mechanical advantage) for producing force. We know almost nothing about how any animal, even humans, does this-– how close to their limits of length are their muscles? Which muscles are closest? Does this change in animals with different numbers of legs, postures, anatomy, size, etc? Such fundamental questions are totally unaddressed. It’s an exciting area to blaze a new trail in, as Rich is doing. So far, we’ve worked with quail, humans, and now greyhounds; in the past I did some simple studies with horses and elephants, too. Jeff Rankin from my team and other collaborators have also worked on six species of birds, of varying sizes, to see how their squat-stand mechanics change. Thus we’ve covered a wide diversity of animals, and now we’re learning from that diversity. “Diversity enables discovery,” one of my former PhD mentors Prof. Bob Full always says. Too true. Greyhounds are interesting because they are medium-sized, long-legged, quadrupedal, quite erect in posture, and very specialized for fast running. Fast runners tend to have big muscles with fairly short fibres. 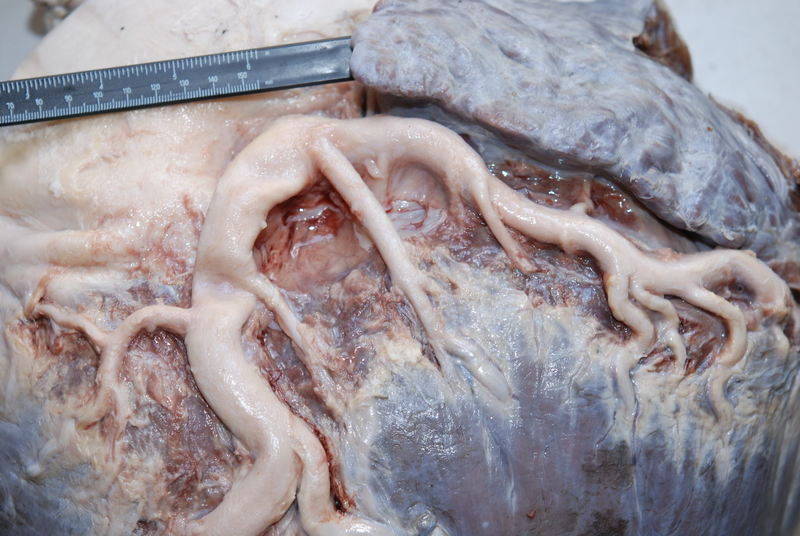 Short fibres are bad for moving the joints through very large ranges of motion. So how does a greyhound stand up? Obviously they can do it, but they might have some interesting strategies for doing so- the demands for large joint motion may require a compromise with the demands for fast running. Or maybe the two demands actually can both be optimized without conflict. We don’t know. But we’re going to find out, and then we’ll see how greyhounds compare with other animals. Those harmless experiments, if you follow me on Twitter, were live-tweeted under the hashtag #StandSpotStand… I dropped the ball there and didn’t continue the tweeting long after data collection, but we got the point across– it’s fun science addressing useful questions. Anyway, the experiments went well, thanks to cooperative pooches like the one above, and Rich has analyzed most of the data. Now the next step involves the cadaver of a dog. 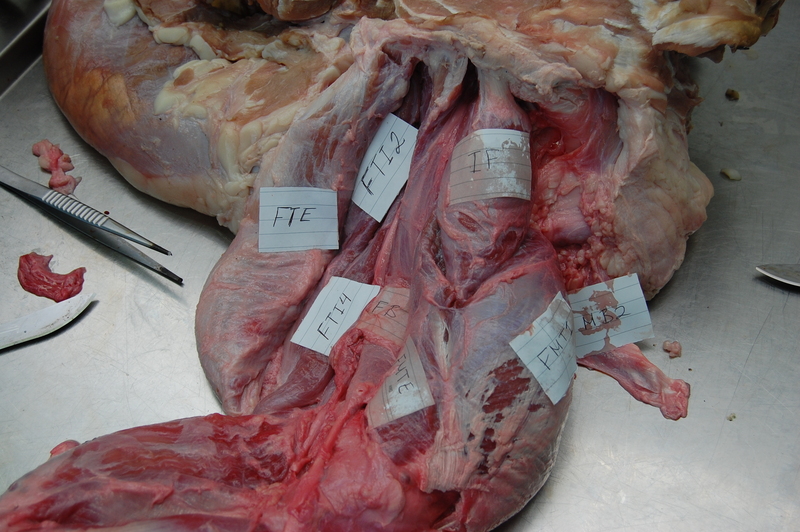 We could anaesthetize our subjects and do this next procedure to obtain subject-specific anatomy. But it really wouldn’t be ethically justified (and if I were an owner I wouldn’t allow it either!) and so we don’t. A greyhound is a greyhound as far as we’re concerned; they’ll be more like each other than either is like a quail or a human. Individual variation is a whole other subject, and there are published data on this that we can compare with. We study the hindlimb because birds and humans don’t use their forelimbs much to stand up normally, so this makes comparisons simpler. 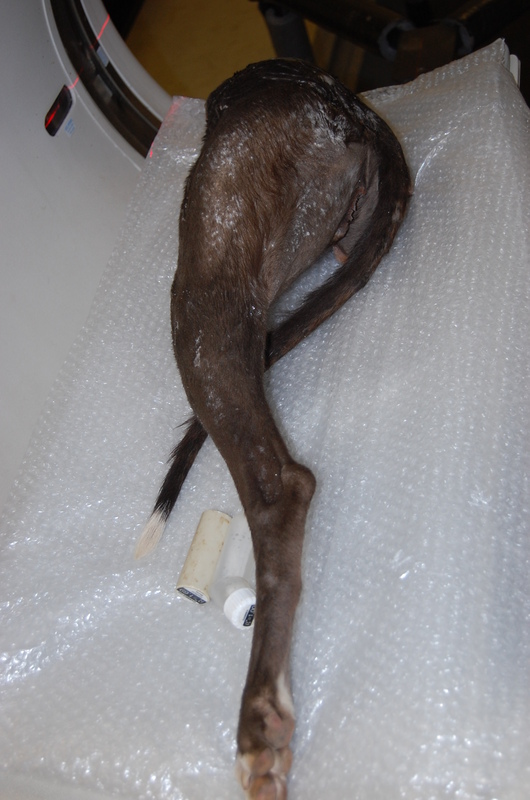 We’re collecting forelimb data, though, as we work with quadrupeds, for a rainy day. It’s not so clear in these images, but I was impressed to see that the muscles showed up very clearly with this leg. That was doggone cool! 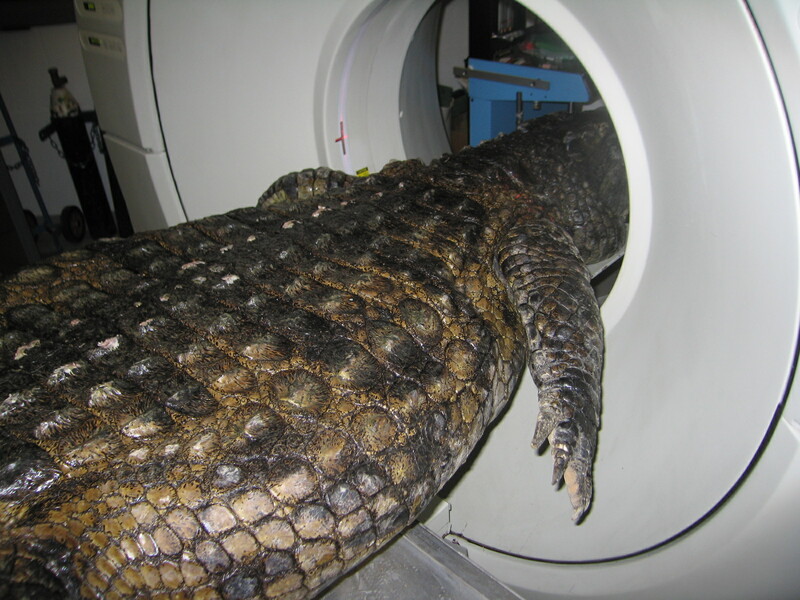 Perhaps some combination of formalin preservation, fresh condition, and freezing made the CT images clearer than I am used to. Anyway, this turned out to be a treat for our research, as follows. 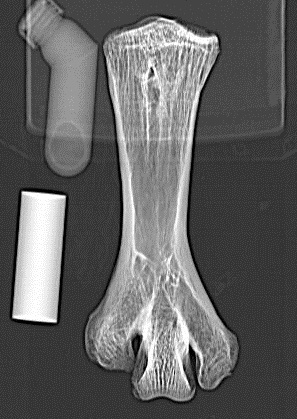 We then use commercial software (we like Mimics; others use Amira or other packages) to “segment” (make digital representations in 3D) the CT scan data into 3D anatomy, partitioning the greyscale CT images into coloured individual objects– two views of one part of the thigh are shown below. The next steps after we finish the limb segmentation are to apply the experimental data we observed for greyhounds of comparable size by importing the model and those data into biomechanics software (SIMM/OpenSim). We’ve done about 40 models like this for various species. 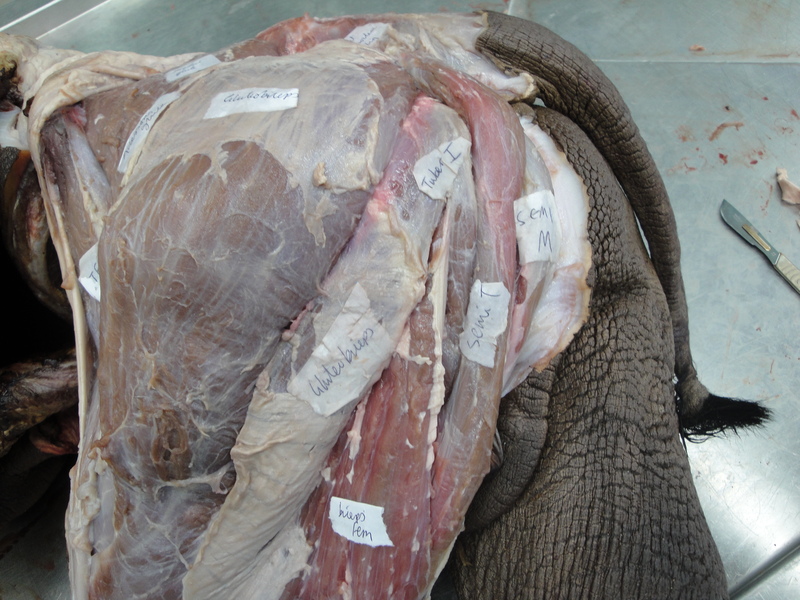 I detailed this procedure for an elephant here. Then, at long last, science will know how a greyhound stands up! Wahoo! Waise the woof! Stay tuned as we hound you with more progress on this research-as-it-happens. Rich just finished the above thigh model this week, and the rest of the leg will be done soon. 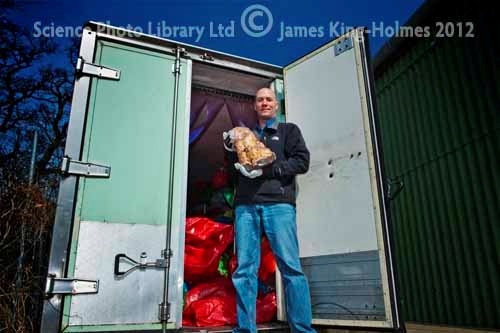 Many thanks to Rich Ellis for providing images used here. And thank you for persevering my puns; they will now be cur tailed. 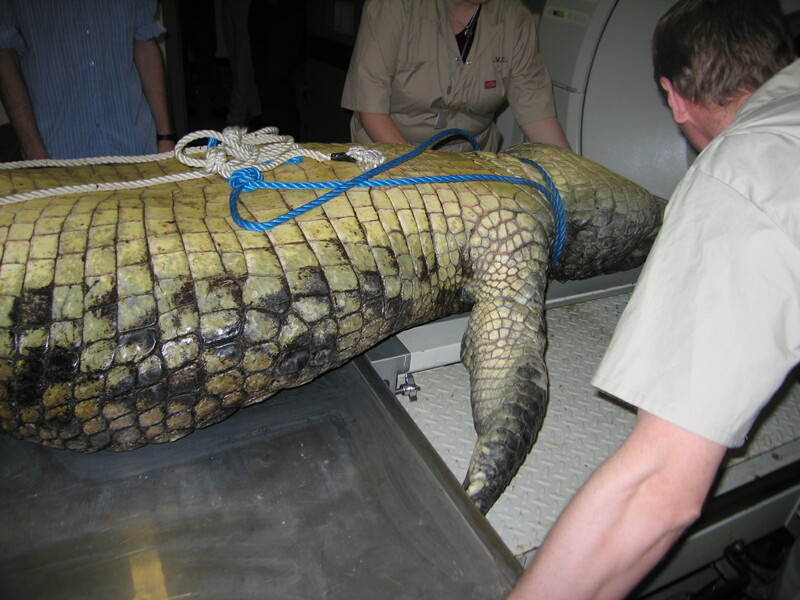 I would be surprised if this was not the reason this animal died (presumably being euthanased at a UK zoo). 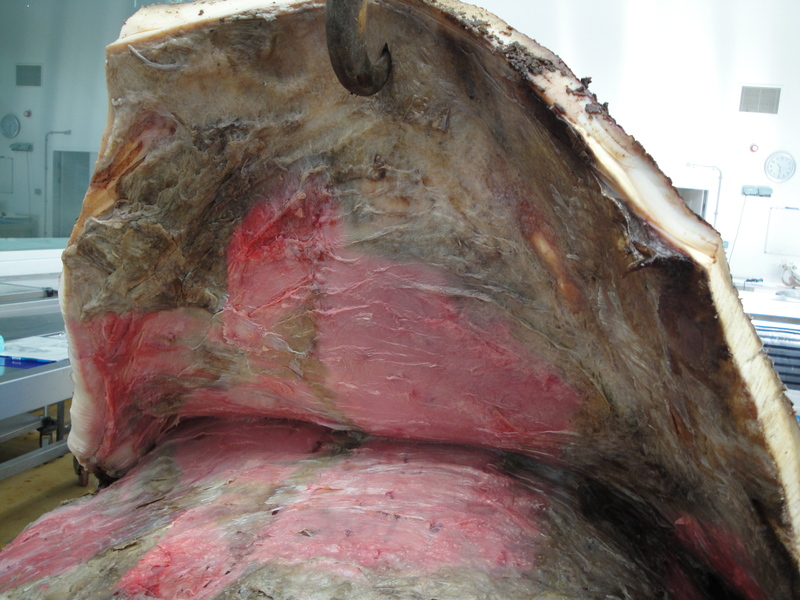 There would have been extensive infection and pain resulting from this bony disease. How did it originate? Who knows. 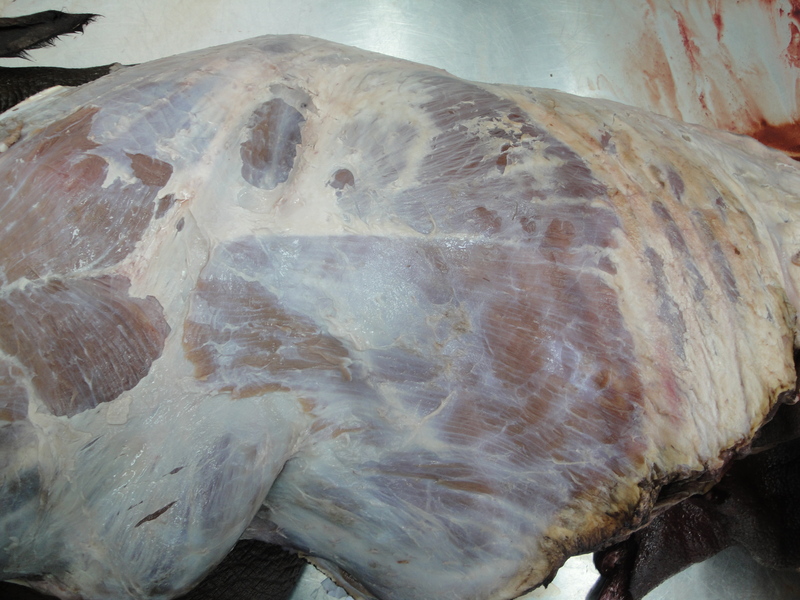 Maybe the animal strained a muscle and bacteria got inside, or maybe there was a fall or other injury. Hard to tell. 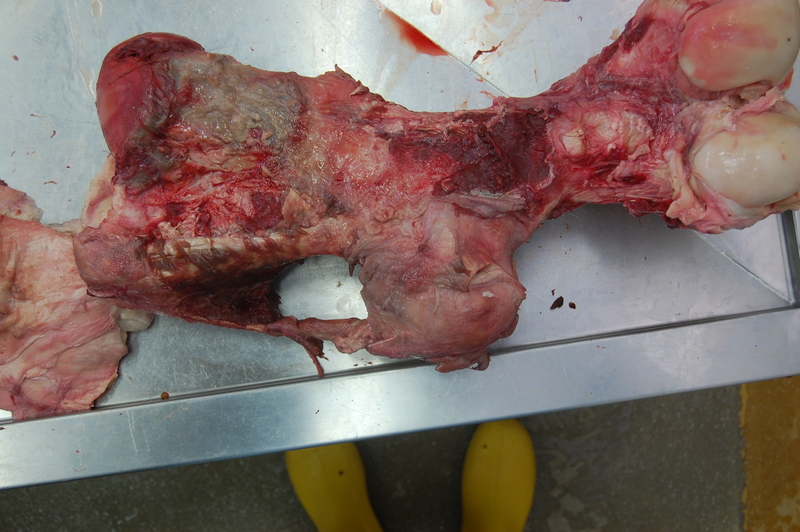 Oh, and also note the lack of a true marrow cavity in hippos, which is true for all the long bones. 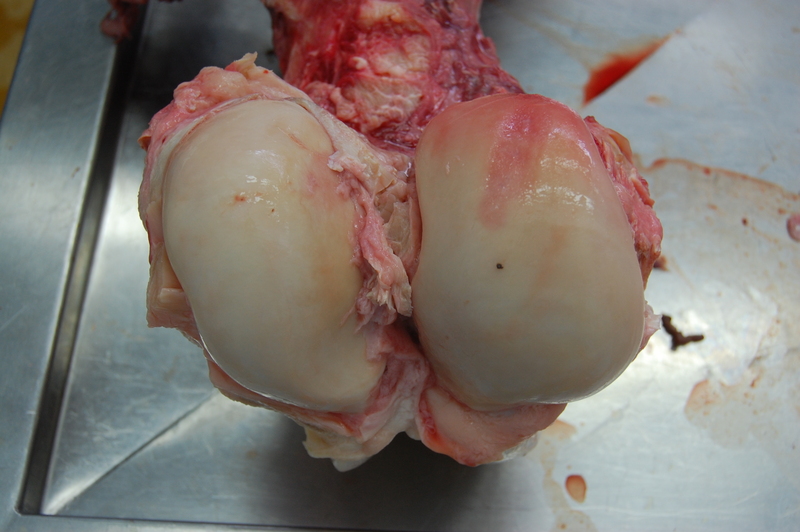 The “cavity” is filled in with cancellous bone. Same with rhinos, elephants, and many other species… science doesn’t entirely know why but this feature surely does help support the body on land, and grants at least some extra negative buoyancy in water; at a cost of some extra weight to lug around, of course. 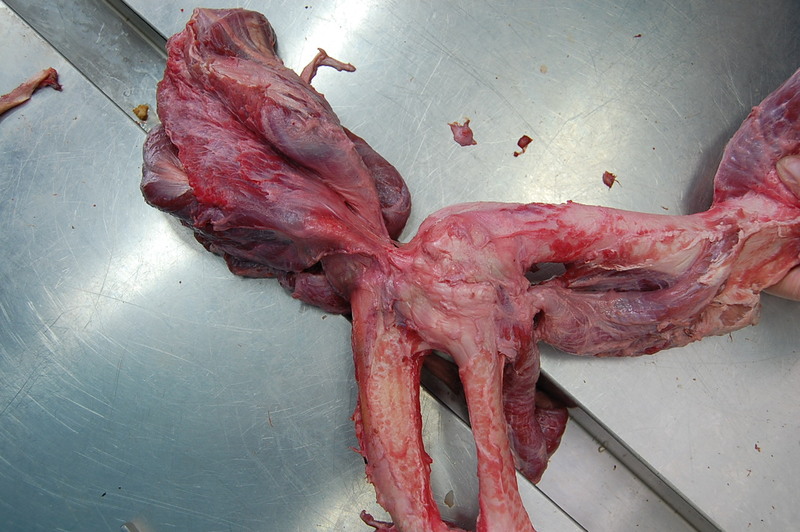 And so ends this Anatomy Vignette. And the beast might be rude, it’s true! 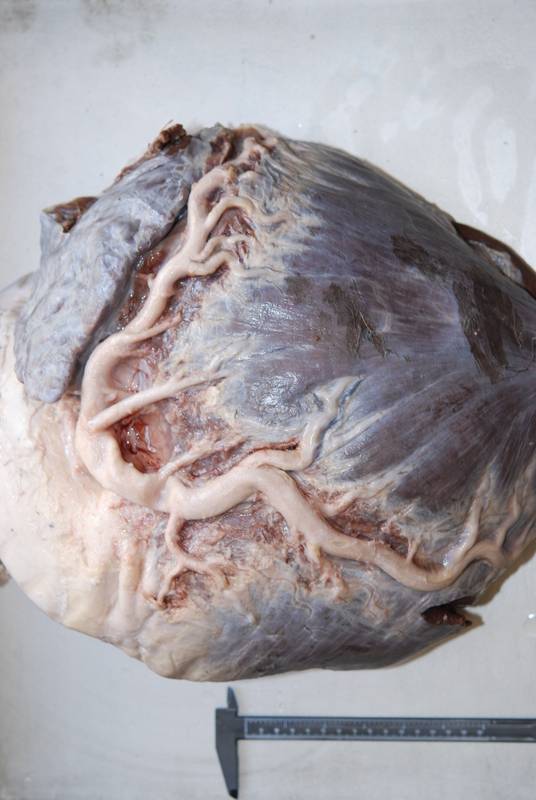 This post is dedicated in memory of the late, great Professor Farish Jenkins, Jr; one of the best anatomists and functional morphologists ever. Excellent retrospectives here and here and here. RULES: 5 pts for correct, spot-on and FIRST right answer, 4 pts for very close or second, 3 pts for partly right or third in line with right answer, 2 pts for a good try, 1 pt consolation prize for just trying, or for a good joke! 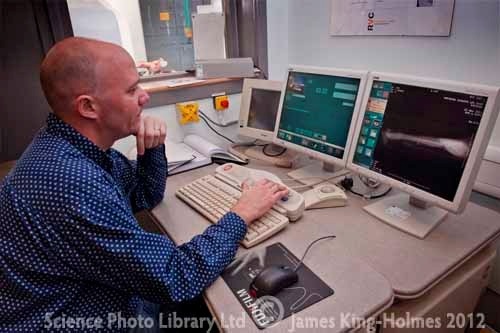 If you post as “anonymous” name then it all goes into the same tomb of the unknown anatomist. 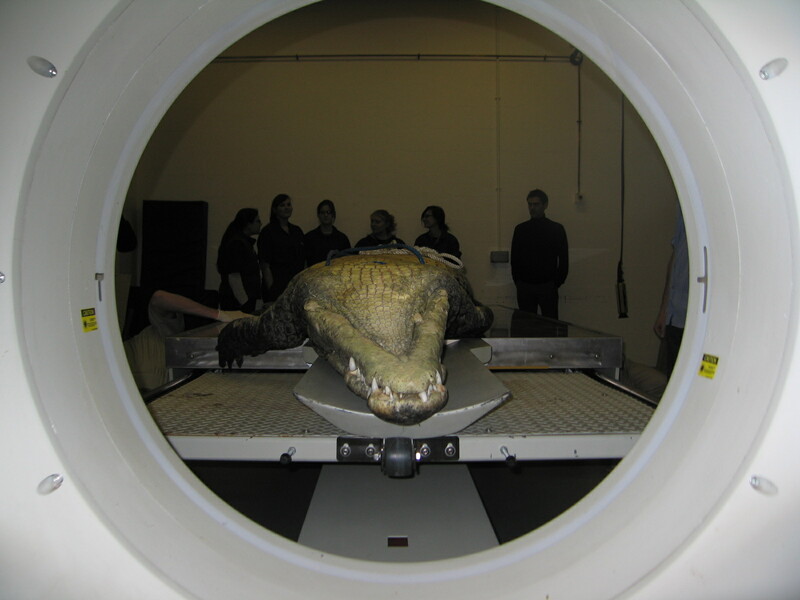 Studying “WCROC,” a 278 kilogram, 3.7 meter long Nile crocodile! I stumbled across some old pics, which I thought I’d lost, from the filming/preparations of 4 episodes of Inside Nature’s Giants (Jan-Feb 2009) at the RVC. They form a nice accompaniment to my previous post reflecting on my experience with the show, and the timing is great because I’m about to head to Raleigh, NC to talk about this research at the Society for Vertebrate Paleontology conference. Stomach-Churning Rating: 4 at first (just a dead animal; and a rather clean one at that), then about halfway through the dissections start and it edges up to a 7 or so. 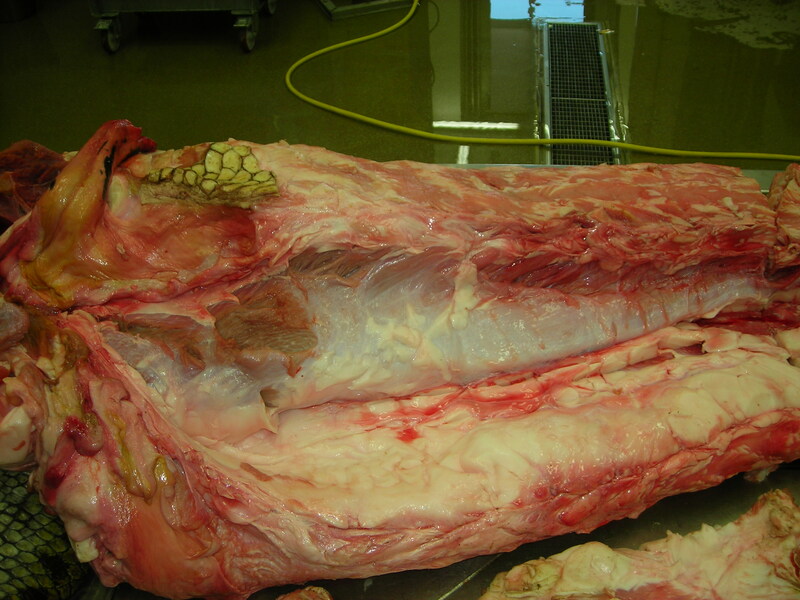 These pictures are sadly some of the few I have of the whole, intact body of a gorgeous adult Nile crocodile (Crocodylus niloticus) that the Windfall Films team managed to get to the RVC from La Ferme Aux Crocodiles in Pierrelatte, France. 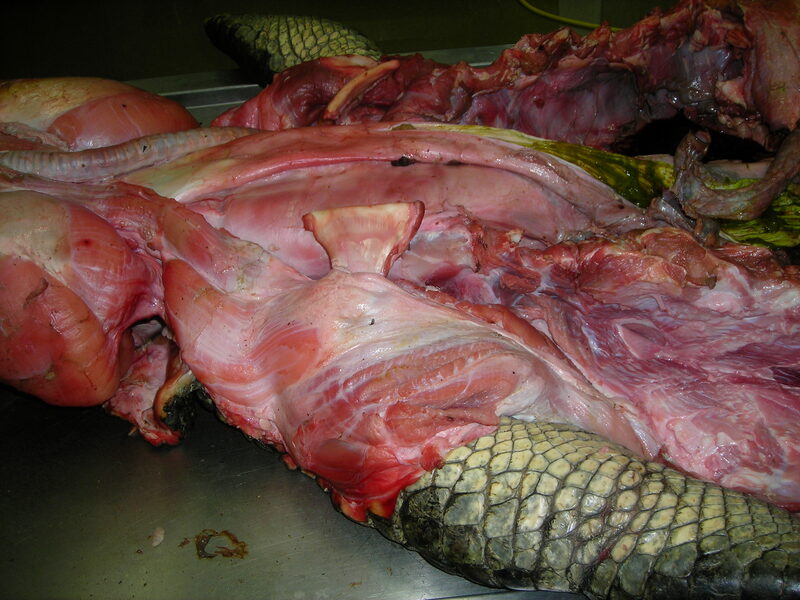 (I have scores of pics of the dissected limbs, shown further below) As the title indicates, it was a nice big croc. 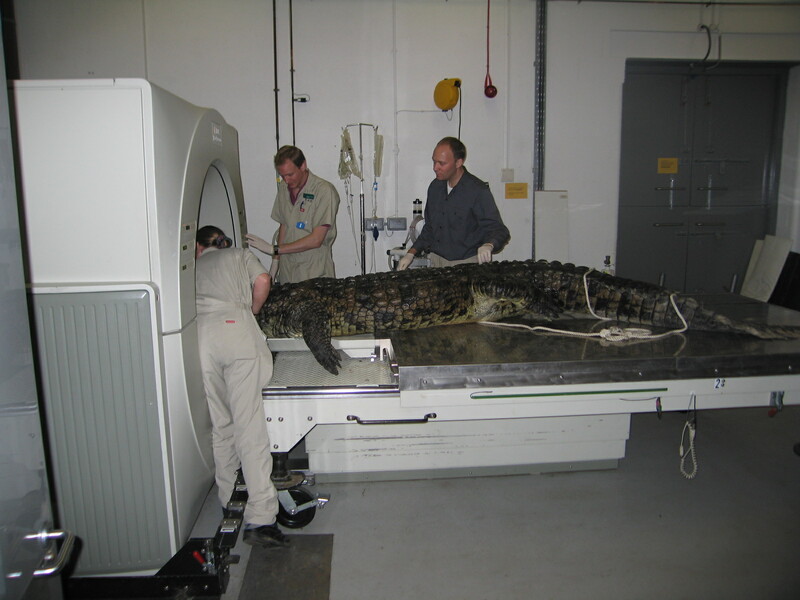 And as you’d expect, CT scanning and then dissecting it was no tiny feat, and makes a fun story. Story time, then, after an introductory pic! 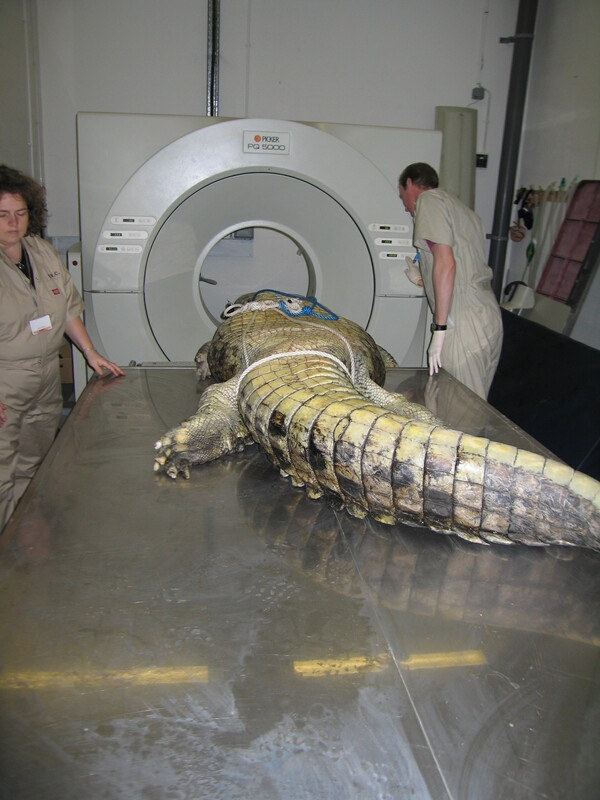 Dr Samuel Martin, vet from La Ferme Aux Crocodiles, brought the crocodile (and some smaller specimens) over to our Hawkshead campus in late January 2009, and we quickly moved to run the specimen through our CT scanner to preserve some details of its anatomy (example shown at the end of this post) and for potential usage in the show. As the photos below illustrate, this was hard work for several people. 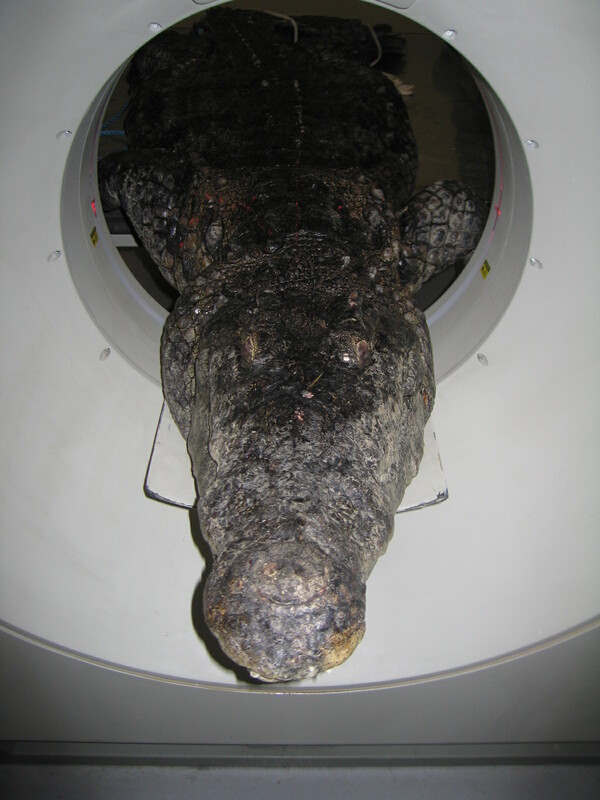 And then, as we were finishing the last CT scans of the specimen, our ageing medical scanner stopped working. And could not be resuscitated. R.I.P., Picker PQ5000 (buy one or two here!). 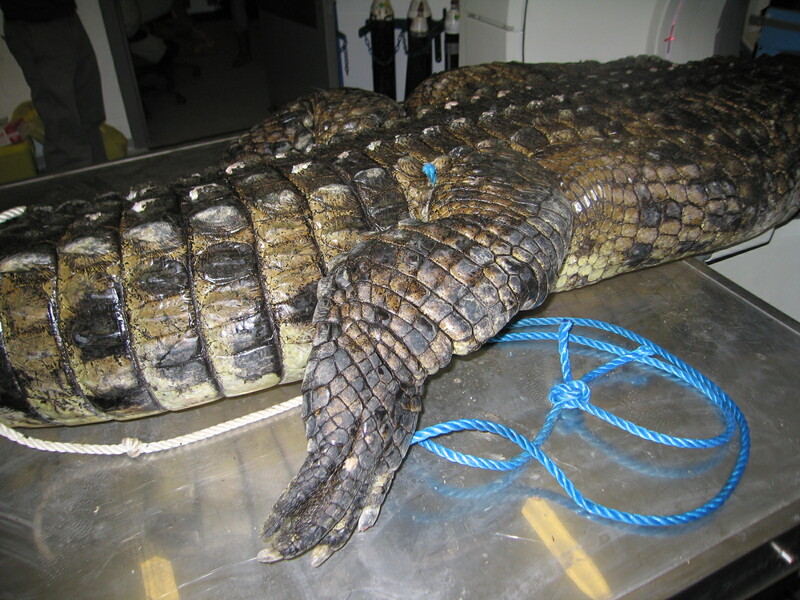 The crocodile, “WCROC” as my team came to designate it, had claimed its final victim. It took about a year for us to get a new one, and that year sucked. It made me appreciate how lucky we are to have a CT scanner just across the parking lot from my office! Anyway, the day of filming I was hoping to make it in to watch my colleague and friend Dr Greg Erickson help lead the dissection team, but a wicked blizzard blew up, and as I was starting the 31 mile drive south from my home to the RVC I realized, from the queue of cars that seemed to be 31 miles long (and train lines shut down), that this was going to be a snow day. So I turned around and came home. Another victory for WCROC! The filming proceeded despite heavy snow delaying many of the key players’ arrivals. 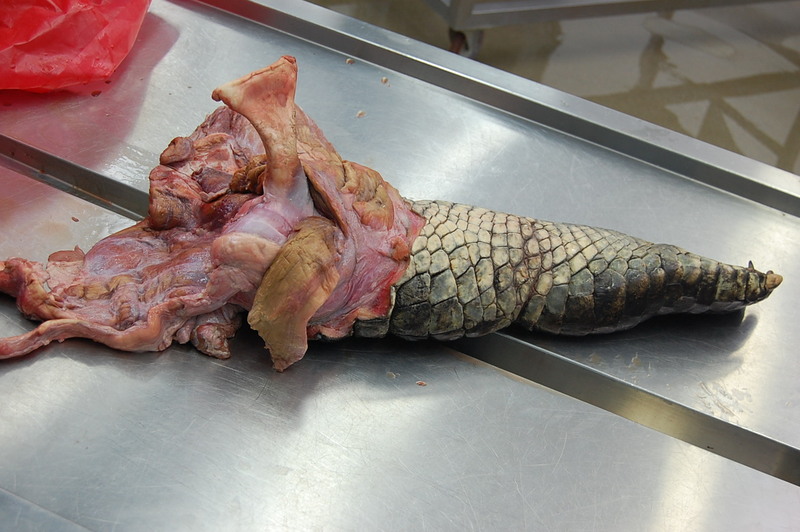 I got filmed a day or two later for a little section of the show on the limbs and locomotion of crocodiles but sadly this got cut from the main ING show (but did air in the National Geographic version “Raw Anatomy“, in the USA at least). 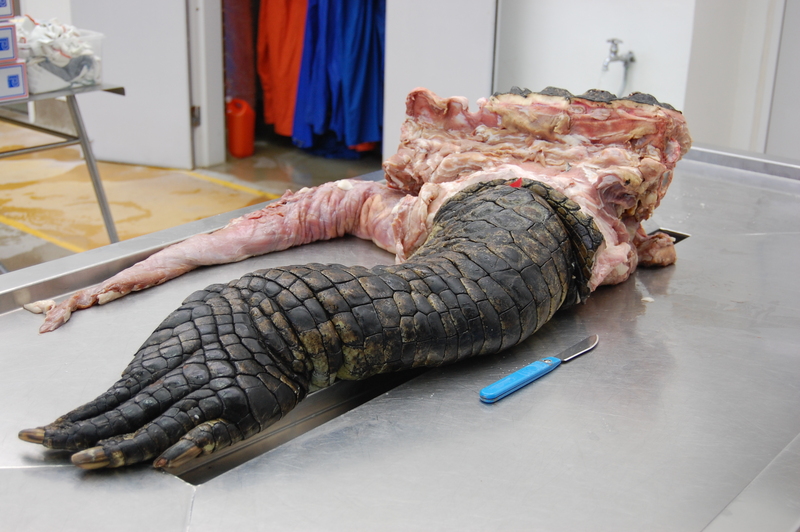 The limbs had been left largely intact, although some of the dissectors who didn’t know croc anatomy very well had slashed through parts of the pelvis and, in eagerness to reach key parts to demonstrate in the show, some major muscles got shredded. 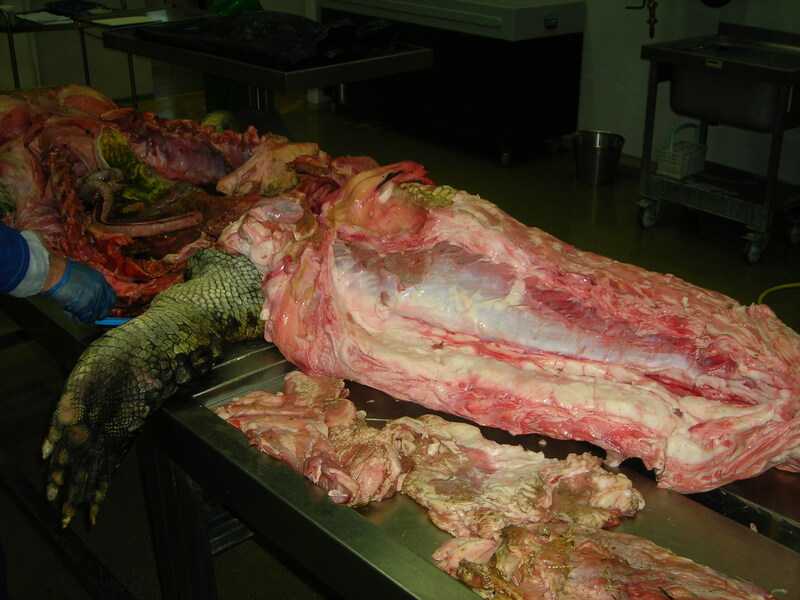 This is no big surprise; crocodiles have a lot of bones all over the place: in their skin (scutes; bony armour), in their bellies (the belly ribs called gastralia), and almost everywhere else, so some brute force is required to get to the gooey bits. 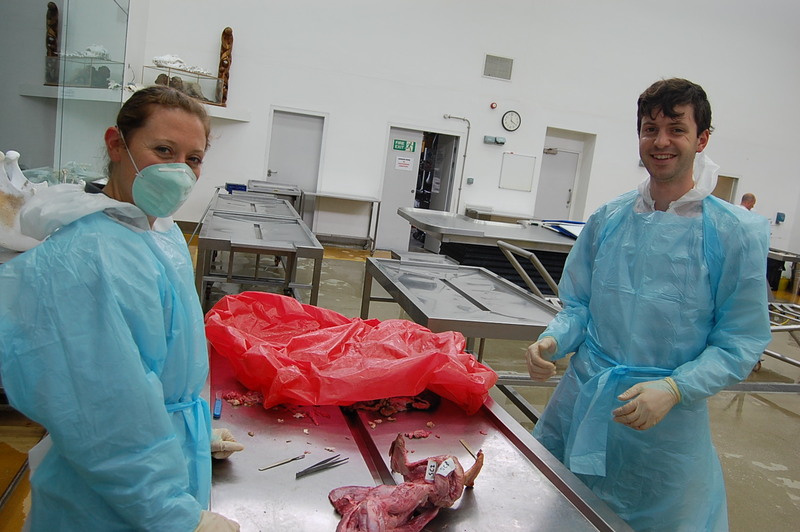 Apparently there had been 6 or so people dissecting at once and things got a little carried away. The curse of WCROC continues? 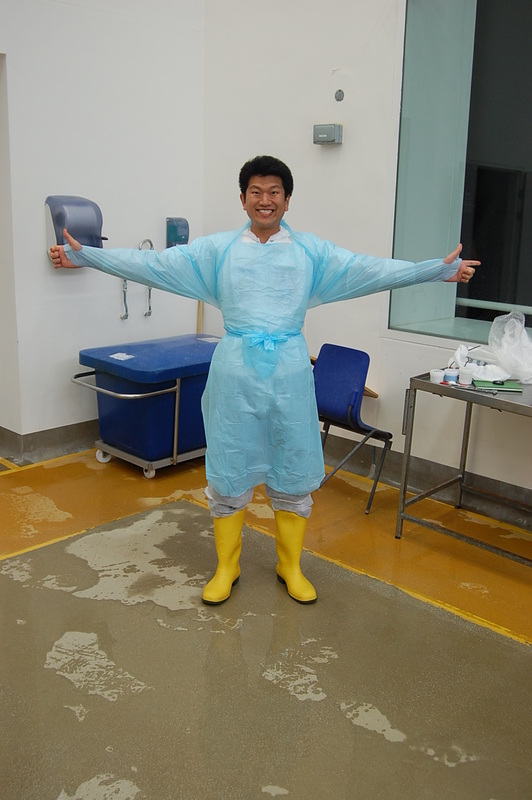 And let’s not leave out the exhuberance of visiting research fellow Dr. Shin-Ichi Fujiwara! 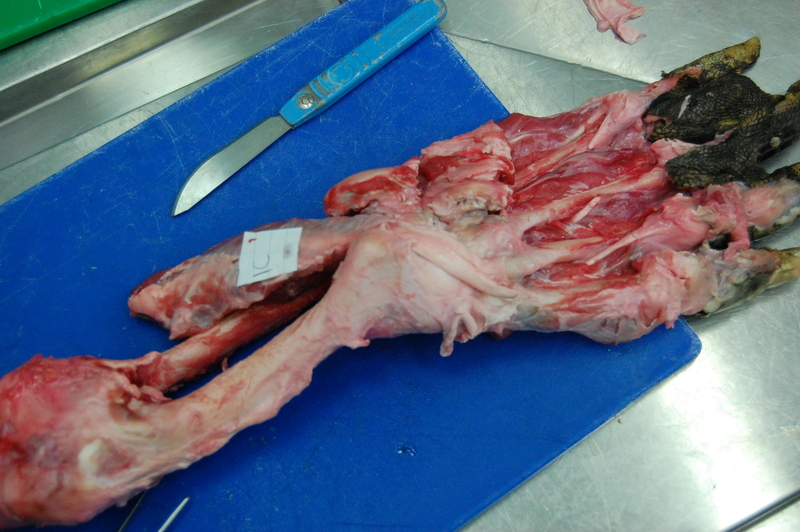 He wanted to inspect the forelimbs for his ongoing studies of limb posture, joint cartilages and locomotor mechanics. And last, the great, paddle-like hind foot! What a great experience that was! 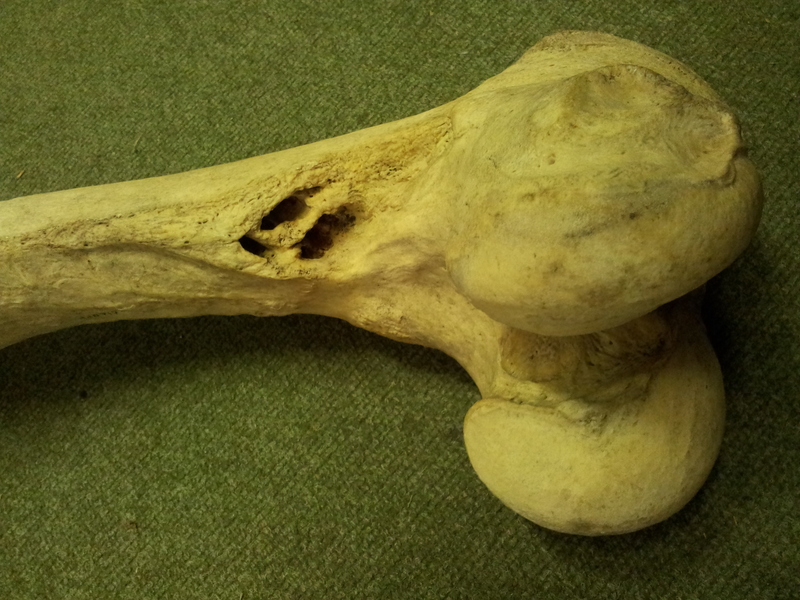 We have fond memories of WCROC, a great documentary from Windfall Films, some nice data– and a lovely skeleton. Perhaps the curse of WCROC is not so bad. Nothing can go wrong now! 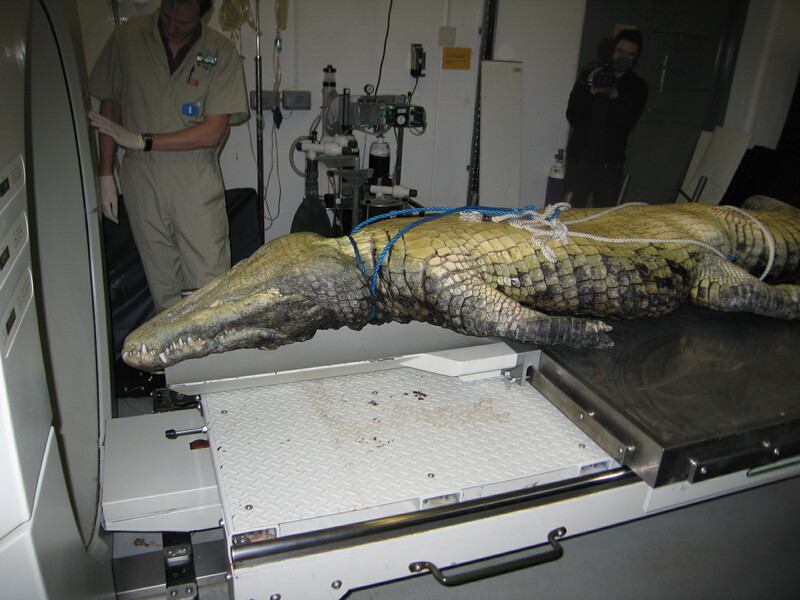 Soon Mieke Roth, scientific illustrator from the Netherlands, is coming here to do a similar dissection on more Nile crocodiles at the RVC. As with the octopus she wrote about in September, she will make a 3D model, but with much more detail and with an emphasis on accuracy and accessibility. The end products will be really cool; think of the visible body, 3d models that can be used in teaching, animations, a book and lots more but also a “how did she do that?” blog. To finance this project (that probably will take a year or more) she will use crowd funding. In several weeks there will be more info on how to participate in her fantastic endeavour. For now, see her video with the initial pitch for “Nile Crocodile 2.0“! 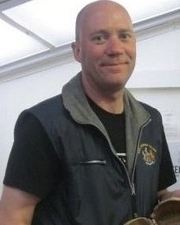 Hi folks, as my birthday present to you, and big thanks for racking up 70,000 blog views in 7 months (and my 50th post! ), here is a new installment of Mystery CT Slice! This time with a pilot (or scout) scan of an odd object. 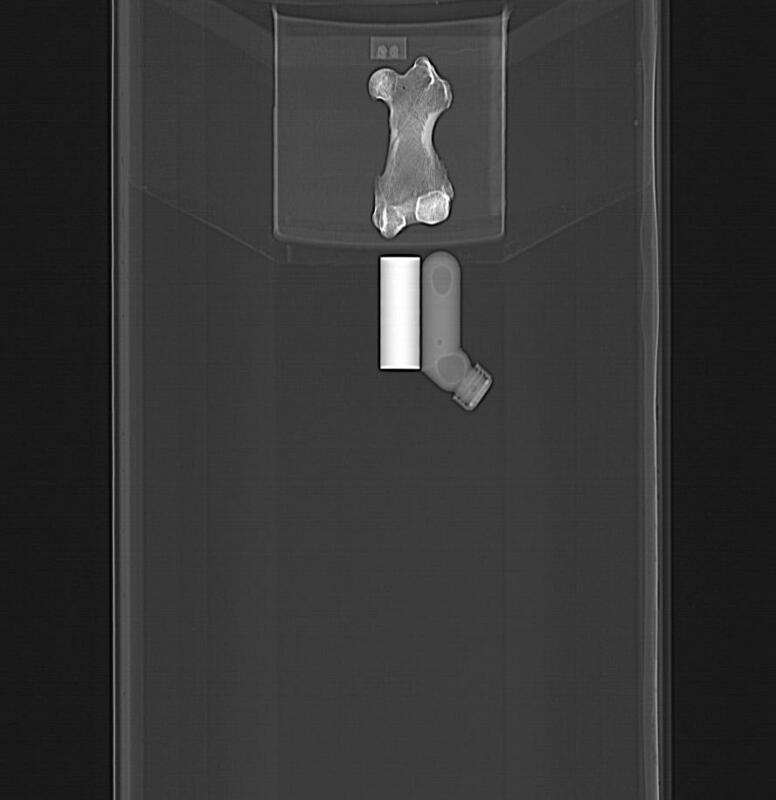 A pilot/scout scan is a quick, low exposure scan used to plan a series of CT slices, which shows a a larger area that is then narrowed down to focus just on the object of interest and a bit of buffer room for those slices. It generally isn’t used for much else, but sometimes can make a neat picture. As you can see here, the pilot scan area was excessively massive relative to the object. 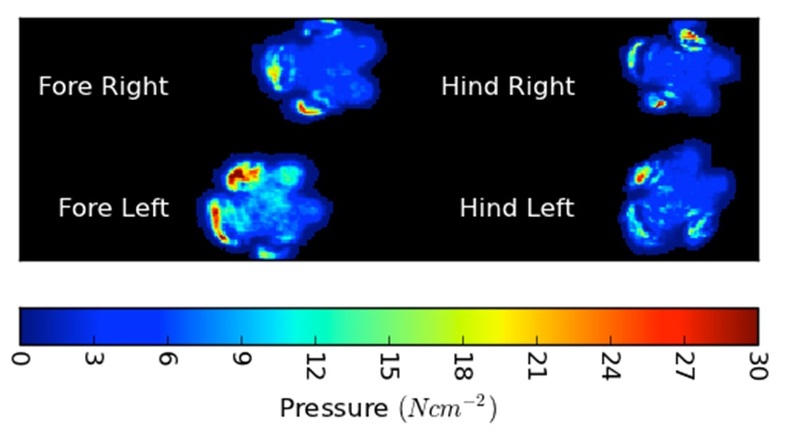 The two odd objects below the primary object of interest are scanning phantoms, used to calibrate density from Hounsfield units to actual real-world density (one is water at 1 g/cm3; the other is “cortical bone” at 1.69 g/cm3). Ignore them. But what is this object and from what taxon? Be as specific as you can, but pinning it down to genus/species level will be bloody hard! Stomach Churning Rating: 1/10; it doesn’t get much tamer than a pilot scan. 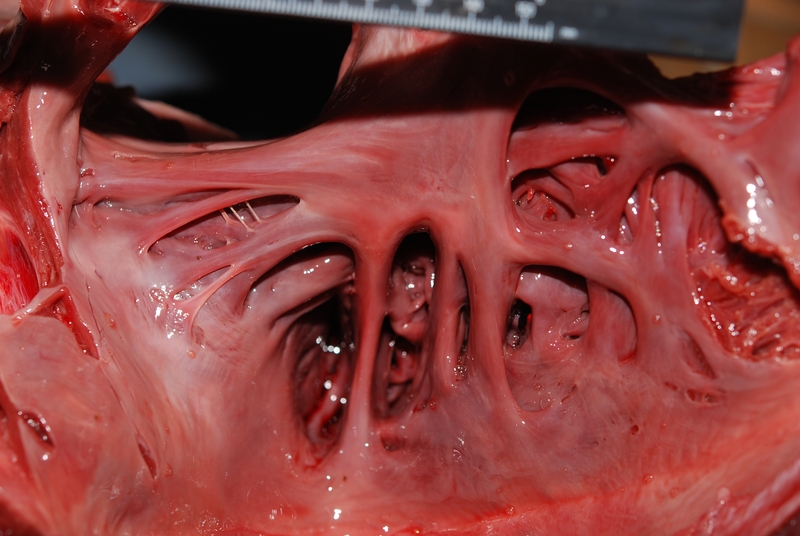 Difficulty Level: small image, hazy, not a lot of diagnostic traits visible, 1 main element. In case you haven’t heard, Saturday, September 22nd, 2012 (today, at this writing) is World Rhino Day! The main websites include here and here. 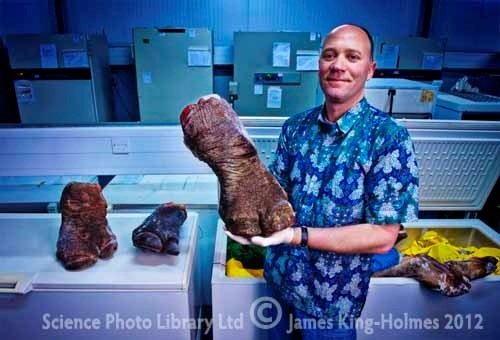 Ivan Kwan has also posted a fantastic blog entry “Rhinos are not prehistoric survivors” for WRD2012- check it out! And if you haven’t seen the WitmerLab’s AWESOME Visible Interactive Rhino site, you really really need to (in fact, quit reading this and go there first; it is soooooo good!). 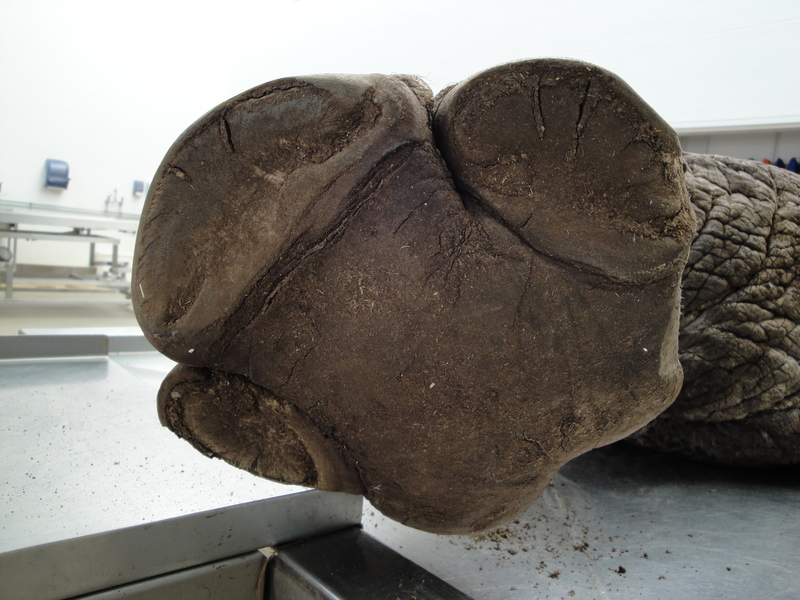 I’ve written about the global rhino crisis before, and about rhino foot pathologies. The title of today’s post may be “cute”, or at least goofy, but the real situation is as grim as the images I’ll share. I won’t repeat the explanation, but all five living species of rhinoceroses are in serious trouble. There’s a good chance that most or all of them will go extinct quite soon– see the previous links for more information on this. Javan and Sumatran rhinos are dangling the most precariously over the precipice of extinction. 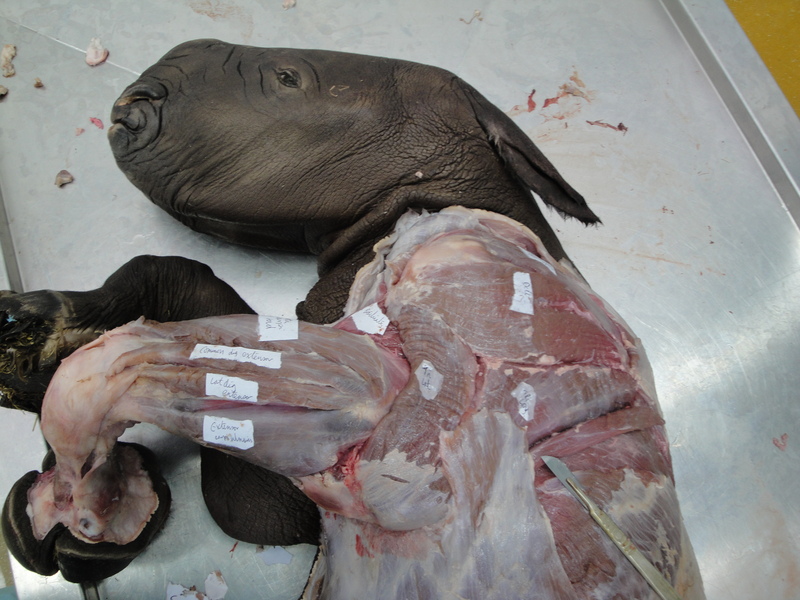 My goal in this post is to share the beautiful, complex and exotic anatomy of rhinoceros anatomy and movement, and the joy of contributing new scientific information about poorly understood species. 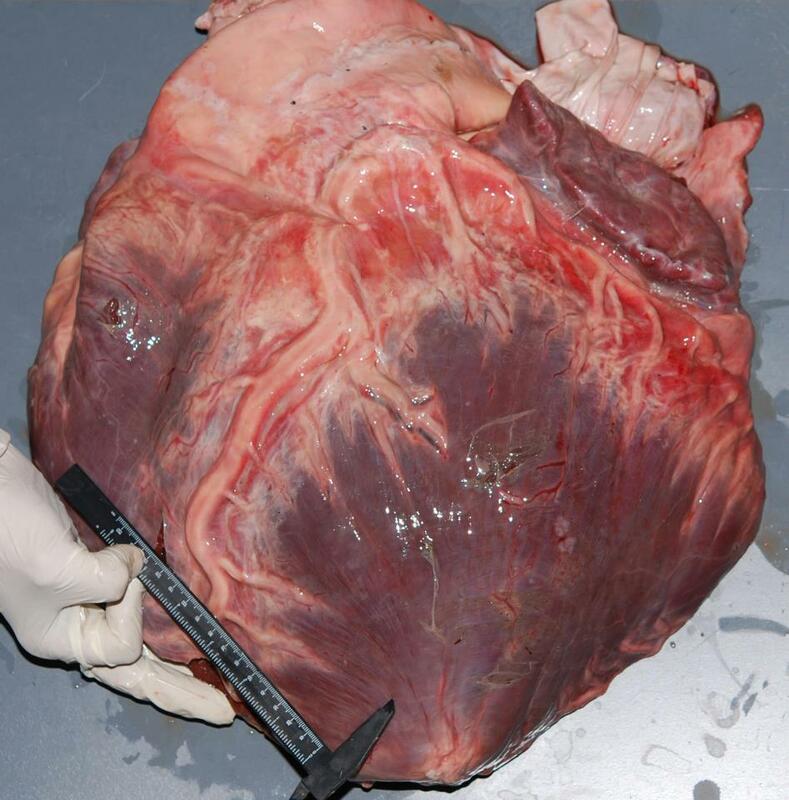 Stomach-Churning Rating: 7/10— dissections, and there are a couple of pics where the specimens are not so fresh, and there’s big skin, and a huge heart. Baby white rhinoceros. 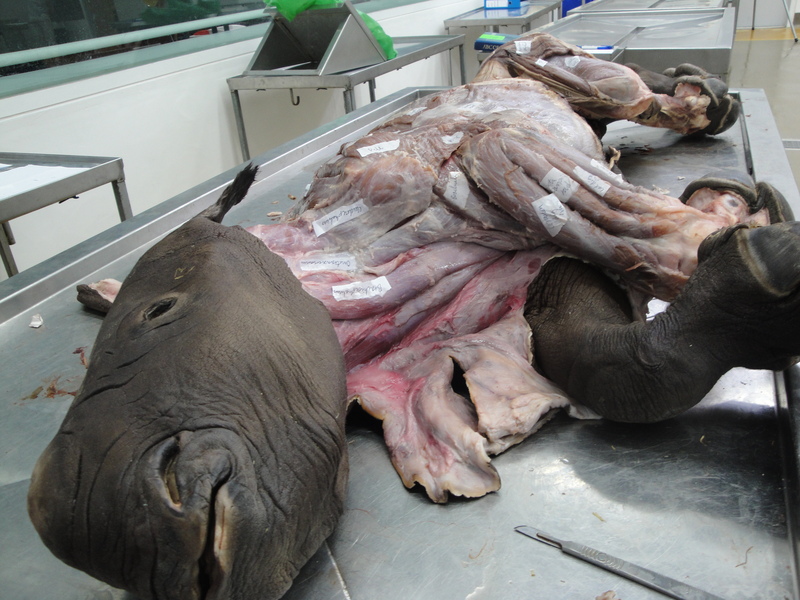 Will frozen specimens like this be all we have of rhinos someday? 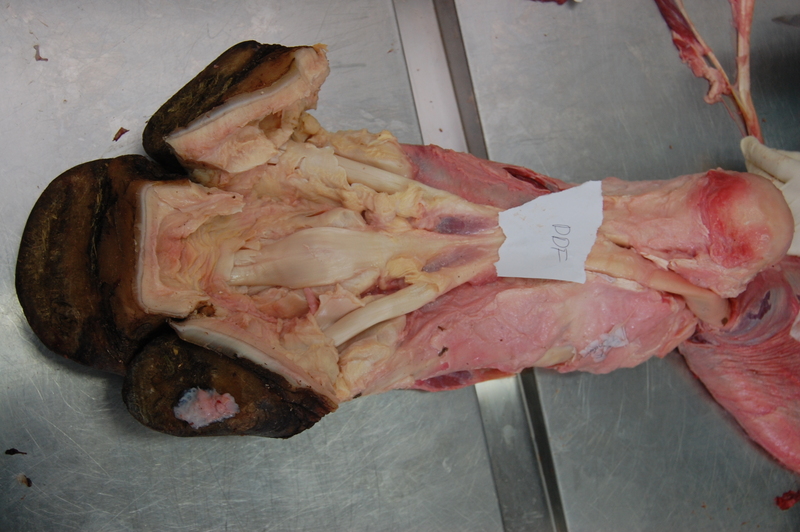 The purpose of today’s rhino post is to share a bit more; especially images; of the work my team has done on rhinoceros gait and limb anatomy; all of it unpublished but hopefully coming soon. We’ve steadily been collecting data since ~2005. Because my previous post went through some of this, I’ll keep it brief and image-focused. First, a video of one of our amusing encounters with a white rhinoceros, at Woburn Safari Park. In this study, we wanted to measure, for the first time really, the gaits (footfall patterns) that a white rhinoceros uses at different speeds, and how often it uses those different gaits. 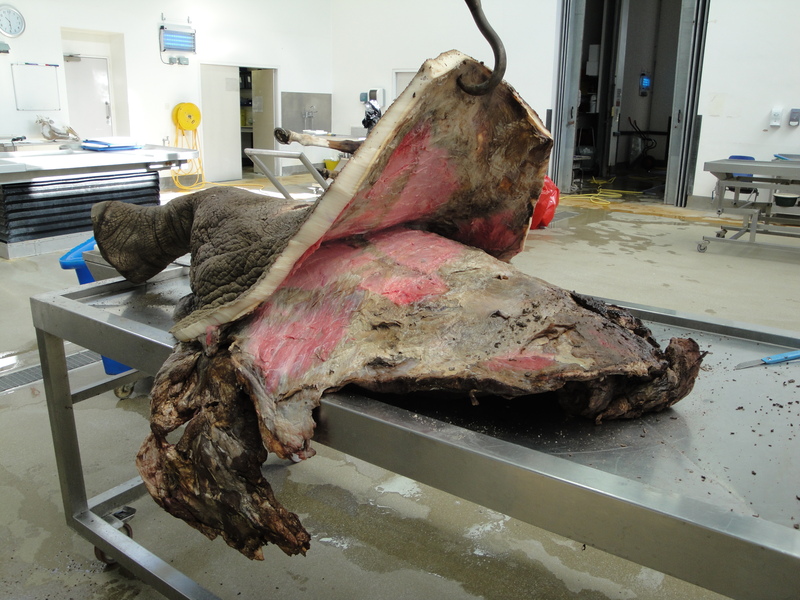 We attached a GPS unit on a horse surcingle around the rhino’s torso, which measured the animal’s speed once a second. We then observed 5 individuals (1 at a time over various days), following them in my station wagon (estate car) across the safari park. We filmed them with a conventional camcorder to document their gaits, and concentrated on the two periods of the day that they’d normally be active: when released from their overnight barn, and when coming in for the night back to that barn. They got rather excited and frisky some of those times. The GPS belt then kept recording speeds for the rest of the day; unsurprisingly, the rhinos generally did not do much. 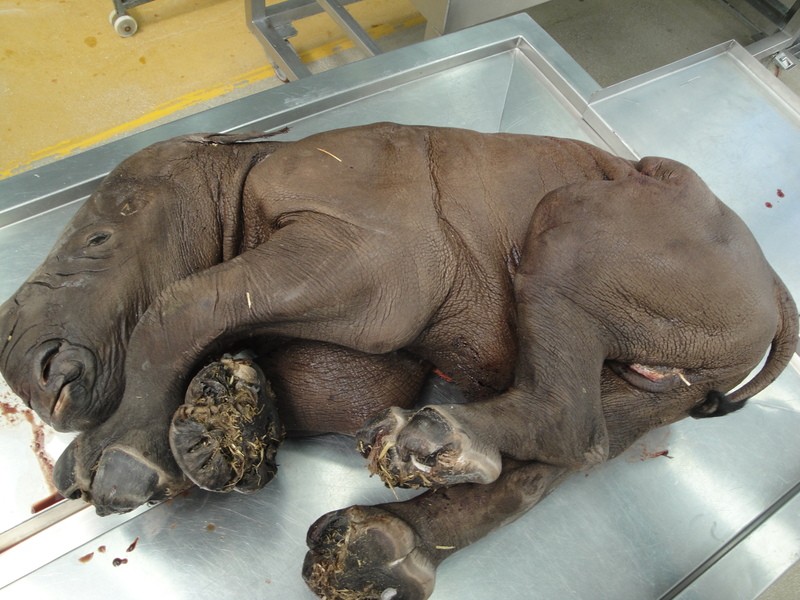 I have to thank Nick Whiting, rhino handler, for his help making this research happen. I’ve been meaning for too long to finish the final paper… soon, I hope! Enjoy this tense scene of a rhino investigating my car (driven by me and with an undergraduate student filming) then having a nice canter/gallop across the field (accompanied by my jubilant narration). Like our foot pressure research, we aim that this work provides baseline data useful to caretakers of rhinos; for example, to test if a particular animal is lame. This follows what we’ve successfully done with elephant gaits and feet, translating basic research into more clinical application. But my major scientific interest is in understanding more about what makes any rhinoceros, even a 2-tonne White rhino, so much more athletic than any elephant (even a baby or 2-tonne small adult Asian elephant). As the video shows, they can use a variety of gaits including cantering and galloping, and trotting at slower running speeds. No elephant ever does that, and no one knows precisely why. 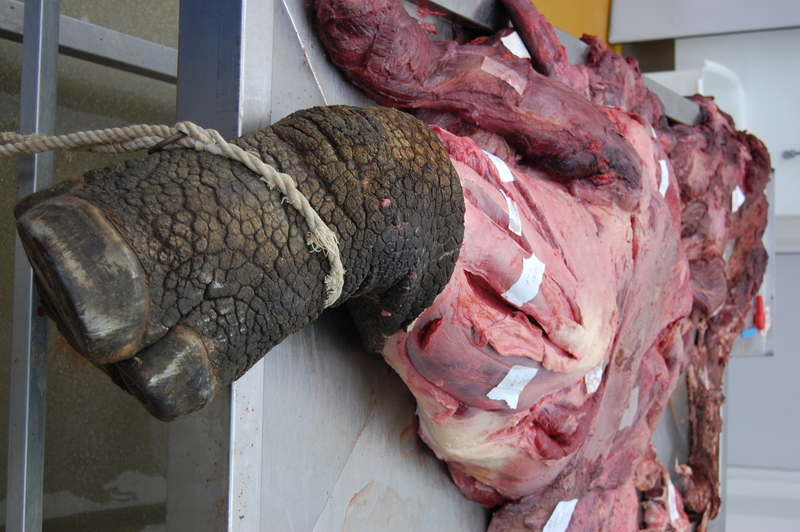 The leg bones are more robust, but the muscles aren’t that dramatically larger in rhinos. 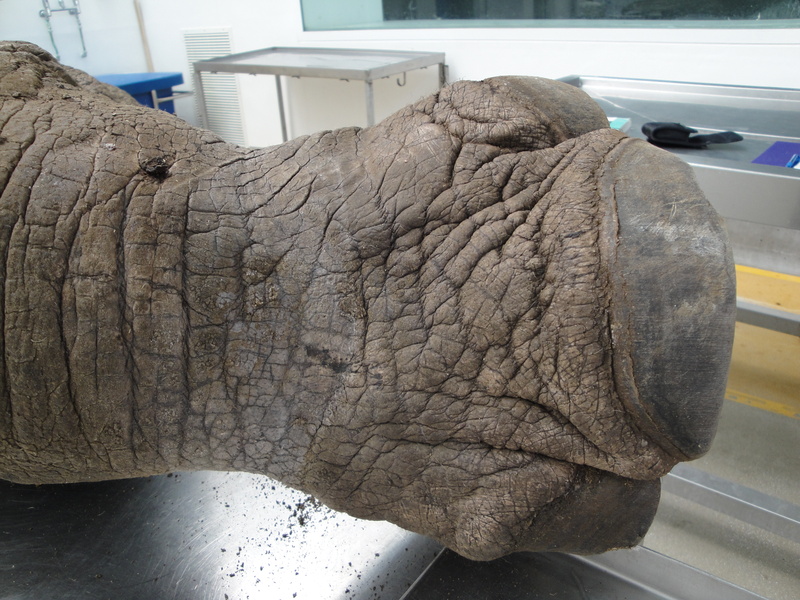 An Indian rhinoceros forelimb- note the characteristic knobbly hide, unlike the smoother, more elephant-like hide of a White rhinoceros. 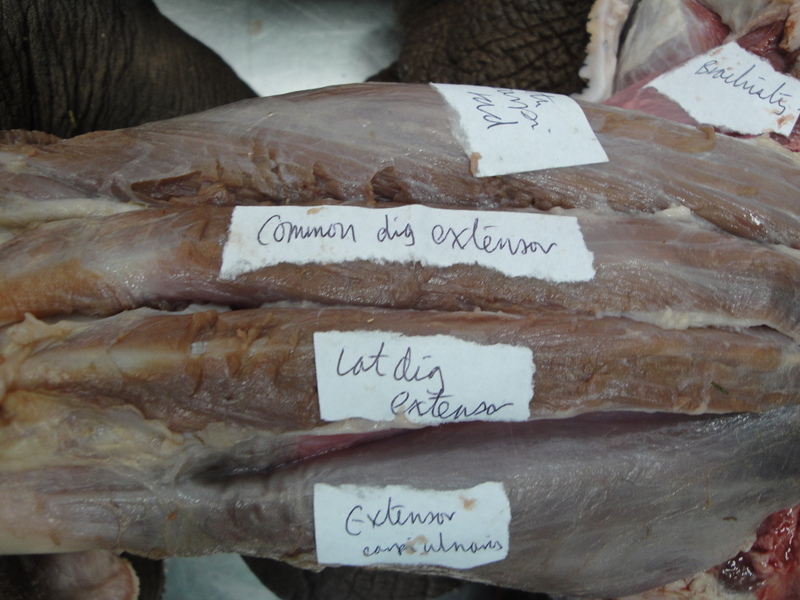 And that ends our tour of rhinoceros limb anatomy and function. Help spread the word of how precious and threated rhinos are; educate yourself and others! And if you overhear someone talking about using rhino horn for medicine, try to politely educate them on the utter fallacy of this tradition. 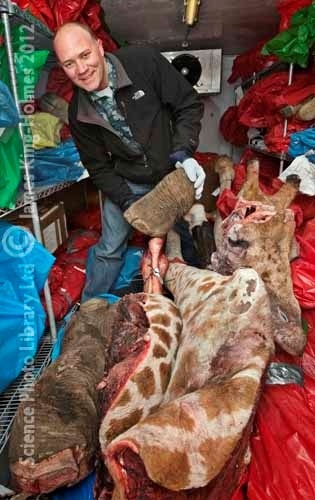 It is this cruel, greedy, ignorant practice that needs to die; not rhinos. 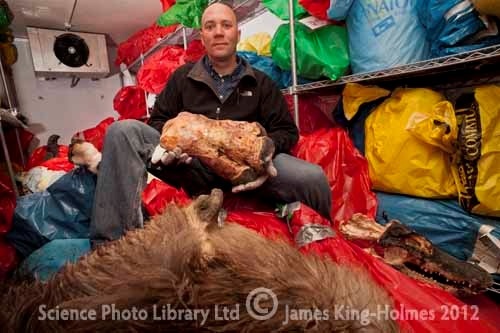 I don’t enjoy receiving dead rhinos, on a personal level, even though the science excites me. I’d rather have many more alive and living good, healthy lives. And my team is trying to do what we can to help others on the “front lines” of rhino conservation make that happen. Big thanks to people on my team that have helped with this and related research: Dr Olga Panagiotopoulou (and Dr Todd Pataky at Shinshu University, Japan), Dr Renate Weller in the VCS Dept at the RVC, Liz Ferrer at Berkeley, and former undergraduate student researchers Sophie Regnault, Richard Harvey, Hinnah Rehman, Richard Sheehan, Kate Jones, Bryony Armson and Suzannah Williams. It’s puzzle time again! For a change, and to make this installment easier but fun and different, I’ll use a movie, of a 3D skeleton segmented from 480 CT slices, rather than just 1 CT slice. Let ‘er rip, folks! Difficulty: not to scale, and dentition/jaws obscured. 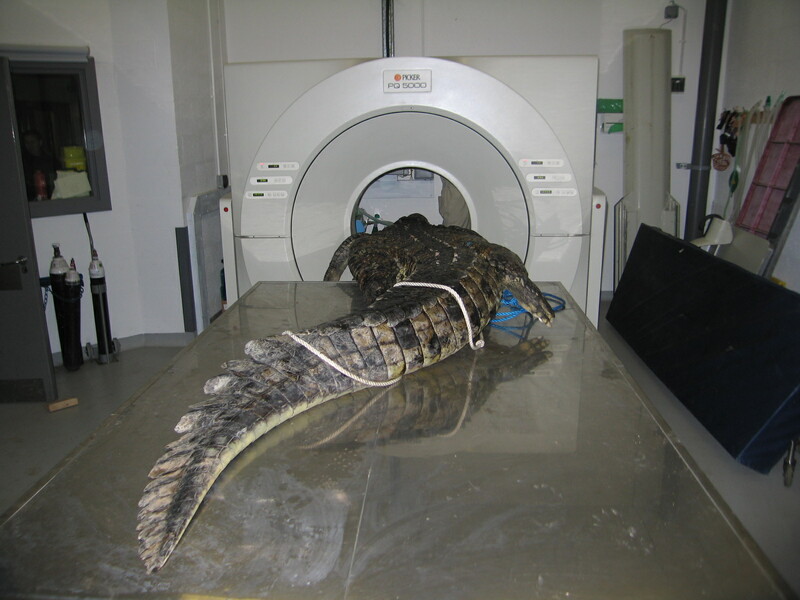 Stomach-Churning Rating: 1/10; c’mon, it’s a CT scan!